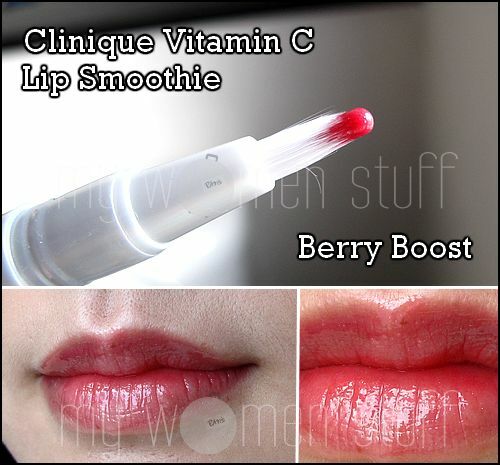 Home » Lips » Lip Gloss » Clinique Vitamin C Lip Smoothie Berry Boost is Berry nice! Clinique Vitamin C Lip Smoothie Berry Boost is Berry nice! 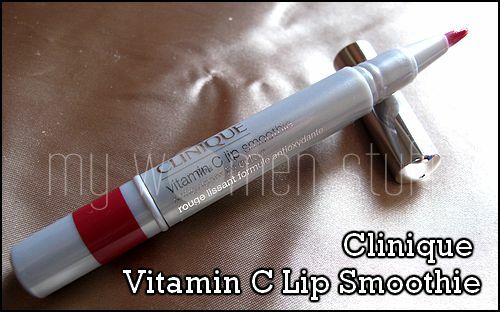 But the Clinique Vitamin C Lip Smoothie is very nice indeed. You like lipglosses? You’re going to love the brush on light formula that leaves your lips looking glossy. Love lipsticks? You’ll like the moisturizing formula with nice pigmented colour. On top of that all, it has anti-oxidant properties thanks to things like Vitamin C, Acai berry (ooh there’s that berry again! Remember its not Ah-Chai!) and Pomegranate. For moisturizing, it has shea butter and Theobrama Grandiflorum seed butter. Very nice in theory – but how does it fare in reality? Well, it fares very well indeed! The colour I have is Berry Boost which is a shade I particularly like! Being a click-pen mechanism, it takes a while before the initial liquid comes out on the brush. I counted something like 25 turns but because you can actually feel it getting harder to turn, you know something is being pushed out and so its not that easy to over do. Once you get over the initial bit, it doesn’t take that much to get the colour out anymore. 2-3 turns just about does it. Colour swatch after the jump. From the tube, Berry Boost is a deep berry shade that I really liked. On my lips however, it sheers out so for someone who likes their pigmented lip colours, it took some getting used to. There is still a hint of berry but what you really get is a glossy berry shade. Picture shows same colour taken under different lighting. What I like is the lip plumping qualities. I don’t know if its meant to do any plumping, but it helps plump up my lips a little (it looks that way anyway!) and makes it look smoother which is quite impressive. It is not sticky, has no discernable smell, is not drying and is gorgeous for everyday use. In fact it feels rather like a coloured lip balm! The Clinique Lip Smoothie comes in 6 shades and costs RM66 at all Clinique counters. Check out Goodness Grapecious over at Beetrice’s Reviews. Give this one a shot. I think you’ll like it too! I just got back from Bangkok last night and am understandably stoned to the eyeballs today. I think I left my brain somewhere over the Andaman sea. Or it could just be the Holiday mood creeping in 😀 Jingle jingle! I hope you like this too. I actually found myself using it everyday! Ooh I love these brush gloss thingies–thanks for review!! The colour looks so nice on you! Doesn’t expect Berry Boost to turn out in this colour. I definitely love sheer colour on my lips. Oho if you like sheer colour, you’d love this one coz my lips feel so super smooth and soft with it on! Its permanent so you can always get it after you’re done with your other glosses. Quite like the color, but might be too deep for me..
my lips need vitamins!! will find some time go to the counter to check this item out. There are another 5 colours to choose from 🙂 The others are a little lighter but still worth a look. Yes I so looovvvveeeeee…!! No other lip gloss I’ve found matches this. Not even Bobbi B’s lip balm/ lipstick/ gloss all in one range. On a down note though… It finishes super fast. Mine finished in one month plus. Your lips look almost translucent… reminds me of those Korean actresses with jelly-like, sheer-colored lips.